"You pour it down your muzzle!" 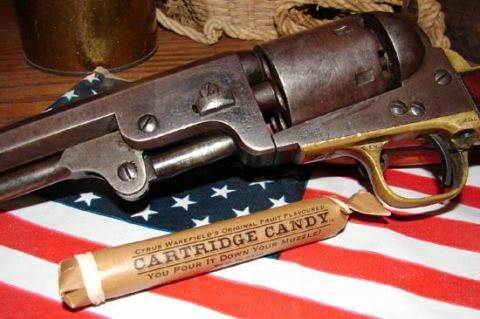 Filled with candy powder and a gumball to replicate the original that was filled with black powder and a lead ball. We recommend that you untwist the end instead of biting it off, the way it was done originally. Comes in 4 flavours: Grape, Cherry, Raspberry, and Fruit Punch. Sold in groups of 4 (1 of each flavour). Each cartridge holds .5 oz.